Tis the season… a heap of expectations come with Christmas in our society. What does this time look like for you? Can a family caregiver, who’s juggling so many responsibilities possibly find joy? Especially this time of year, “We’re all climbing a mountain with the anticipation of reaching the top…to find peace and happiness. But just as we near the top, something always knocks us down,” said our pastor at Sunday morning’s mass. I watched his face looking about the congregation, scanning our reactions. He had my attention, as he went on to say, “We may reach that peak, but I don’t know too many people that get to stay there too long” . Christmastime brings more hustle and bustle than many of us can handle. Shopping, baking, cooking, planning, and decorating are but a few of the things that lead up to the holiday, blowing up our daily routines and rhythms. Finding balance with everything we are now juggling, amidst the chaos of the holiday season, can become “joy busters”. What is that "mountain" for you? What are you working towards...and are you getting slowed down or pushed back? Could the very things pushing you back become the stepping stones to rest upon? The moments to re-evaluate and adjust expectations? Is impatience or wanting everything to be perfect making it harder for you and pushing you back...away from that Christmas mountain top? Does pride make you unwilling to ask for or receive help? Is it fear? Does the lack of resources….financial, physical, etc….push you down? If we can honestly scrutinize the things that push us back and keep us down, then we can be aware, and thus make progress! How do We Find Joy? The question of joy is answered differently for each of us. But the path to finding and feeling joy can be the thing we share in common. If our focus is the push to get to the joy of Christmas day…where it culminates…then I believe we will not find the joy we seek. Rather, if we focus on our steps, give ourselves permission to slip and go sideways for a day, then look around to find something of joy to rest upon before moving on…we can slowly make our way…with moments of joy along the way. They are there. We must intentionally find them. 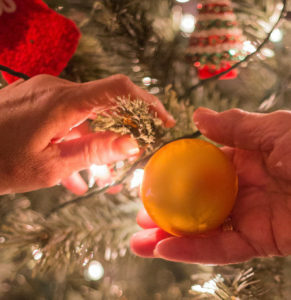 In our family, decorating the tree is an annual tradition with our parents. Mom has very specific ways she wants the tree decoration to happen and how things are placed. This year, however, things were not going according to plan. Mom was not happy. Dad was not too stable on his feet, so he remained seated. We were fumbling to get the ornaments hung with so many people giving direction. So, we adjusted. We asked dad be the decision maker on which ornament to hang next and where it should be placed. It took a lot longer…but we filled the time talking about the old ornaments and the stories they held. The last ornament was a funny looking snowman. We asked dad to walk it over and hand it to mom. Picking up his cane, he made it to the edge of the tree and he gently handed it to her to hang. Stepping back, we looked at our work. It was beautiful! Was it done the way mom had planned? NO. Was it done the way I thought it was going to be done? NO. It was done the way it ended up getting done, without forcing our way through the way it “should” go. Steps were altered. We paused. And, with intention there were stories, activities and gifts of memories along the way. You have the ability to decide each day what one thing can bring joy into your life, making the days leading up to Christmas fulfilling. Set intentions. Maybe it’s a phone call during a break you take to reconnect with someone. Or, maybe it’s a decision to forgo putting up all the decorations you usually have and instead making time to watch an old Christmas movie together instead. Or, perhaps you delegate things and let go of doing them yourself. Remember, it’s not the top of the mountain that we are seeking to rest upon. It’s the steps and beauty along the way where we will find our joy. May your Christmas season be filled with planned and surprising moments of joy!